Preheat the oven to 325º F, and line a 9 x 5-inch loaf pan with parchment paper. Stir the mixture very well, and then add the salt, vanilla and espresso powder. Stir for 1 minute to cool the mixture. Cool the brownies in the fridge. Add the chocolate chips to the pan, and cover. Let sit undisturbed for 1 minute. Remove the chocolate mixture from the fridge, and use a small spoon to make small dollops of the mousse that are about 1 tablespoon each. Begin adding these chocolate mixture pieces to the bowl while beating the cream. After a few minutes, everything should be homogenous and fluffy. Add the espresso powder to the mixture, and beat just to combine. Scrape the mousse on top of the brownie in the pan and refrigerate for an hour before serving. To decorate, heat the heavy cream in the microwave until steaming hot, about 45 seconds. Add the chocolate chips and stir until they melt. If they don’t want to melt, place the bowl back in the microwave and heat on 50% power for 30 seconds until everything melts. Remove the brownies from the pan using the parchment paper handles. 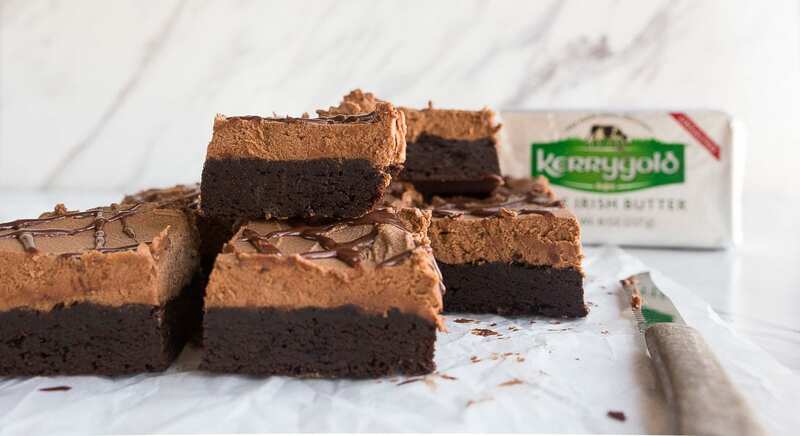 Drizzle the melted chocolate over the mousse brownies, slice into 8 pieces and serve.